They love SpongeBob so much. "Hey, hey, kids! Your old pal Krusty is going to teach you five new words: unlicensed use of my image!" Copyright and Trademark law have gotten in the way of or forced cancellation for many works. No matter how promising, popular or profitable a show is, it's still apt to get canceled if it would be illegal to keep broadcasting. This can be prone to What an Idiot! moments on the part of the owner of the intellectual property in question, since if it's that profitable, it makes sense to license the work rather than shut it down, unless of course the artist is Doing It for the Art. Fans may have to Keep Circulating the Tapes if legal troubles also forbid a home release. Sometimes, the reason why a trademark is so zealously protected is because the holder wants to prevent it from entering common use as a generic term, which would cause them to lose it. This has happened with Aspirin (once a Bayer trademark, they lost it in many countries after World War I), Cellophane, and other "genericized" trademarks. It's also why most productions bend over backwards to make sure that Real Life product names are not mentioned at all (unless as Product Placement), and certainly never as generics. But note that this only applies to trademarks, not to copyrights. Additionally, note that (contrary to the common misunderstanding of this law) a company is never legally required to protect a trademark in order to keep it — they don't lose it simply for failing to protect it; they only lose it if it enters common use as a generic term to the point where it is no longer trademarkable. The Other Wiki refers to this as the tragedy of the anticommons , where the existence of competing rights holders — not just in copyright, but also in patent law,note Where it's a very serious problem, since technology is iterative; many companies are highly annoyed by the "patent thicket" keeping them from developing new software and (especially) new smartphones, since so much is patented and they can't build on current without stepping on a patent or two or two hundred. However, no company has an incentive to end the thicket, since they regard their patents as leverage against others. Then there are the patent trolls who buy up patents solely to start lawsuits. land ownership,note Most often when someone has a big project and needs to buy up a bunch of lots, giving landowners an incentive to hold out for a higher payday leasing rights and other areas — frustrates achieving a socially desirable outcome. To further complicate matters, organizations of all kinds try as hard as possible to blur the lines between copyrights, patents, and trademarks in their favour. Related to Screwed by the Network. The phrase "Customer Notice: *Insert name of company*, the owner of this channel has forced *insert name of cable or satellite provider* to suspend it despite our repeated requests to keep it available to you" often pops up on certain television systems in the event of a contractual negotiation dispute between the channel owners and television providers providing the systems in question. 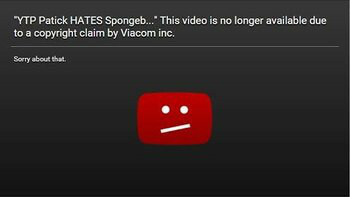 Notable disputes that led to these kinds of messages include the December 2009 blackout of Fox-owned channels from Time Warner Cable (now Spectrum) and the July 2012 blackout of Viacom-owned networks from DirecTV and even the March 2019 blackout of Viacom-owned networks from AT&T U-Verse and DirecTV. Local station owner Sinclair Broadcast Group managed to do this to themselves when attempting to acquire rival Tribune Media. When the deal was first announced, many expected the merger to sail through easily if Sinclair complied with all the necessary divestments they had to make to get FCC and DOJ approval. But Sinclair's ego got the better of them and attempted to divest most of the stations to people who had significant ties to Sinclair so that the broadcaster could still operate the stations without actually violating the laws on paper. The FCC, who under a business-friendly administration was relaxing media ownership rules to benefit companies like Sinclair, wasn't pleased with Sinclair's proposal and refused to sign off on it, and Tribune, who was getting fed up with Sinclair's aggressive tactics, as well as the prolonged regulatory review, decided to break up the deal and sue Sinclair for breach of contract. Garfield had a short run of Believe it, or don't gags until PAWS Inc. got a cease-and-desist letter from the Robert Ripley estate. Unlike other games in the series, Zen Studios' Spider-Man pinball is not available as downloadable content on some platforms' versions of Pinball FX or Zen Pinball. Instead, licensing disputes between Marvel Comics and Sony require the player to purchase a separate game, "Marvel Pinball", and get it there instead. ECW used popular rock, metal, punk, and hip-hop tracks for everything, from wrestler themes to show themes to video packages, to further their image as a hip, rebellious, underground promotion. Unfortunately, it was also a very cash-strapped promotion, which meant that said music had to be edited out of home video releases to avoid legal entanglements. Part of the reason the promotion commissioned and published the ECW Extreme Music and ECW Anarchy Rocks CDs was so that they could have less expensive cover versions by less well-known bands at their disposal instead. The wrestling vampire Gangrel was used much less in WWE after White Wolf threatened to sue for infringement, as Gangrel was the name of one of the vampire clans in its Vampire: The Masquerade RPGnote The writers were given RPG books as reference material, not realizing that "Gangrel" was not a public domain name like "Nosferatu". They settled for a 5-year agreement which White Wolf would be credited in any material in which Gangrel was used. White Wolf would eventually sue the WWE in 2008 after they used Gangrel in the Raw 15 Year Anniversary Battle Royal without credit. It would turn out that White Wolf failed to protect the trademarknote Having failed to publish any new material with the name "Gangrel" in it for a number of years, giving the wrestler the full rights to the name. After the American Wrestling Association went under, former employees started Super Stars Of Wrestling to keep some of their income flowing. They also decided to keep the AWA name going but didn't have as strong a claim to it as they thought. A lawsuit by WWE ended up putting an end to the brand in North America. Fittingly, it was lawyers who ended up putting an end to "The Beat Down Clan" when Hernandez joined the group only for TNA (who had not checked beforehand to see if they could legally put him on their program) to find itself unable to use any footage of him on their program due to an existing contract Hernandez had with Lucha Underground. WWE Network was forced to pull all Stampede Wrestling footage from the service after only a few days when Bret Hart claimed he had the rights to all Stampede footage featuring him, though they are free to continue circulating footage of him from the other promotions he has signed with, WWE included. Due to Universal's exclusive licensing contract with Marvel Comics a decade before Disney's acquisition of Marvel, Disney is severely limited in the Marvel-themed attractions they can build at Disney parks in Orlando and Japan, as Universal's theme parks in both areas have built Marvel theming first. Disney is only able to use the characters Universal didn't use such as Doctor Strange and the Guardians of the Galaxy. This is why when Disney announced a new "Marvel Land" for their theme parks to open in 2020, the Orlando and Japan parks were left out of the mix. Universal themselves got into a similar situation after acquiring DreamWorks Animation in April 2016. While they are free to use DreamWorks' main franchises in all three of their American resorts, as well as their Japan and Singapore parks, Universal can't use them in countries where DreamWorks had licensed them to other park operators prior to the acquisition, including Australia, Russia, Dubai and China, where other companies have the licensesnote On a side note, Madagascar nearly got stuck into this limbo in America since SeaWorld initially had the rights to the characters, but they let the license for those characters lapse months before Universal took over DreamWorks. Similarly, the 1964 Rankin/Bass likeness of Rudolph the Red-Nosed Reindeer, whose special is now owned by Universal through DreamWorks, was licensed out to SeaWorld by DreamWorks in November 2015, a few months before Universal purchased the studio, so don't expect him to appear in Universal's American parks anytime soon (though he might be allowed in the Japan and Singapore parks, if Universal is willing to pay royalties to The Rudolph Company). With Disney acquiring 20th Century Fox on March 20, 2019, the future of The Simpsons Ride is very uncertain as unlike their contract with Marvel, Universal's rights to Simpsons theme park attractions are set to expire in 2028, 20 years after the attraction opened. Yep, you probably know where this is headed. Universal also confirmed that the American Horror Story haunted house for Halloween Horror Nights would not be returning for 2019 and beyond because of the deal. In 2003, Roberto Aguirre-Sacasa was set to premiere Archie's Weird Fantasy, a stage play about Archie Andrews coming out as gay, at Dad's Garage Theatre Company in Atlanta. The day before the play's first performance, Aguirre-Sacasa and Dad's Garage got hit with a cease-and-desist letter from Archie Comics, forcing them to quickly rename it Weird Comic Book Fantasy and change all the characters' names (Archie became "Buddy Baxter", Betty and Veronica became "Rosie" and "Monica", Jughead became "Tapeworm"). Given that Archie Comics hired Aguirre-Sacasa to write Afterlife with Archie in 2013, and then hired him as their chief creative officer the following year, they've clearly patched up their differences since then. It's largely thought that Epoch renamed the Sylvanian Families into Calico Critters when selling the toys in the US due to a lawsuit brought on by electronics company Sylvania (or to keep from being confused as being related to them). Wikipedia says the reason for the name change was because Tomy lost the right to sell them under that name in '93, while the website doesn't acknowledge either. However, the animated series was allowed to be released on DVD under the original title. The site had a game based on the See 'n Say toy where a main character would speak if the pointer landed on the corresponding picture. The game was revamped in 2007 to a generic toy with buttons making the characters say the same lines. The legal implications associated with the change are apparently so extreme that the site's wiki bars ANY mention of the See 'n Say version. In spite of this, the original game still can be accessed as a secret page. When "Strong Bad Sings" was released to DVD, the song The Cheat played for Strong Mad had to be changed to "Hot Cross Buns". At the time of its release, the lyrics to the original song, "Happy Birthday to You! ", were considered copyrighted. The Trainsformers shorts, which were a blend of Thomas the Tank Engine and The Transformers, gleefully poked fun at being unauthorized use of copyrighted material and a violation of it. It shouldn't be a surprise that a copyright protest brought down the four videos made. However, the creator lampshaded this in two non-copyright-infringing follow-up videos, and other YouTube users re-posted the videos, anyway. This infamous Penny Arcade strip showing Strawberry Shortcake In the Style of... American McGee's Alice had to be taken off the site due to a cease and desist letter the creators got from American Greetings. In Schlock Mercenary, the "The Seven Habits of Highly Effective Pirates" had to be changed (even in past strips) to the "The Seventy Maxims of Maximally Effective Mercenaries" after receiving "the world's politest Cease and Desist letter" from FranklinCovey, the owners of the "Seven Habits..." trademark eight years after the fact. However, Howard Tayler claims he didn't mind seeing as he was looking for an excuse to change the name anyway so he could use the Maxims in The Merch. Mike R. finally explained why Rusty and Co. spent several weeks down in December-January 2012-13. There was a danger of years-long lawsuit, but he and his attorney were able to prove that Rusty and most other elements are covered by OGL, public domain or parodies. Still, a few things did trespass Wizards of the Coast's product identity limitations. For example, Yuan-Tiffany the yuan-ti had to become Y.T. the lamia. His Kickstarter page still says "Rusty the Rust Monster - Plush Toy is the subject of an intellectual property dispute and currently unavailable. [...] Thanks for your patience." But the toys have already started shipping. The Dysfunctional Family Circus, a Remix Comic of Bil Keane's Newspaper Comic The Family Circus, was shut down upon receiving a cease and desist letter. Greg Galcik initially intended to fight it in court, but changed his mind after a (very sympathetic ◊) phone call from Bil Keane himself. They did let the site go on for one more comic (the 500th one, no less). As can be read here , this trope is why I Was Kidnapped by Lesbian Pirates from Outer Space is no longer available online. Because Platinum Studios brought the rights to LPFOS in 2006 and that it's a successful webcomic under Platinum's brand, she couldn't host/draw the comic on her own anymore. One fight gets cut short because it involves a Dungeons & Dragons monster that Wizards of the Coast didn't include in its Open Game License. The lawyers haul away the offending creature. Invoked by Vaarsuvius, who cuts a Wizard Duel short by exposing their enemy as an Overused Copycat Character. Vaarsuvius: Aren't you a violation of a certain popular fantasy author's intellectual property?! ?